In the text field enter the terms you wish to graph, with each word or group of words separated by a comma. Enter beginning and ending dates as four-digit years, indicating the range of creation dates for comparison. Use the “Enter” key or click the “Go” button, and a Sequence Graph will appear below the form, along with tables listing the frequency and count of each term. Hovering the mouse cursor over the graph displays the relative frequency percentage of all terms for that year. For a list of frequently occurring terms, use the “Back to corpus” link. 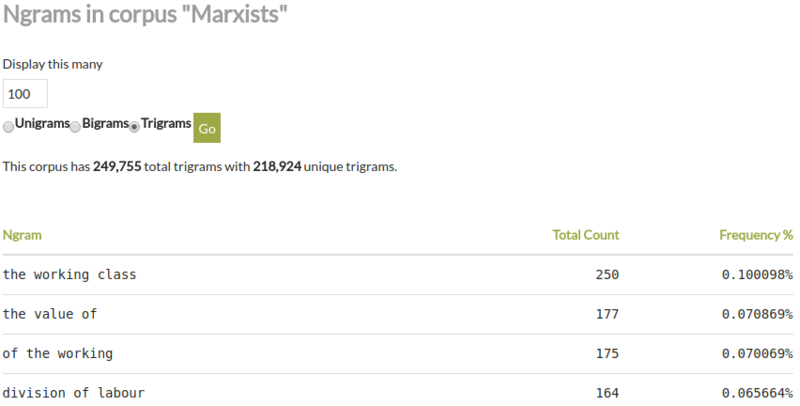 Select “Unigrams,” “Bigrams,” or “Trigrams” to display the most popular single words, two word pairings, or three word combinations.